Prime Minister Narendra Modi will visit Guwahati, Itanagar and Agartala on Saturday. He will lay foundation stones for Greenfield Airport at Itanagar, Sela Tunnel and North East Gas Grid. He will inaugurate the DD Arun Prabha Channel and Garjee – Belonia Railway Line. He will also unveil several other development projects in the three states. Prime Minister Modi will reach Itanagar from Guwahati on Saturday morning. He will unveil a series of development projects at IG Park in Itanagar. The Prime Minister will lay the foundation stone for the construction of Greenfield Airport at Hollongi . At present the nearest airport to Itanagar is at Lilabari in Assam at a distance of 80 km. Airport at Hollongi will reduce the distance by a fourth. In addition to providing better connectivity to the region, the airport will also unravel the tourism potential of the state. The airport will boost the economic growth of the region and will be of strategically important to the nation. The airport will have various sustainability features like green belt along approach road to act as noise barrier, rain water harvesting, use of energy efficient equipment, etc. The Prime Minister will lay the foundation stone of Sela Tunnel in Arunachal Pradesh. It will provide all weather connectivity to Tawang Valley for civilians as well as security forces throughout the year. The tunnel will reduce travel time to Tawang by an hour and boost tourism and related economic activities in the region. A new dedicated DD Channel, for Arunachal Pradesh – DD Arun Prabha will be launched by the Prime Minister at IG Park, Itanagar. The channel will be the 24th channel operated by Doordarshan. Prime Minister Modi will also dedicate 110 MW Pare Hydroelectric Plant in Arunachal Pradesh to the nation. The project constructed by NEEPCO will harness hydro power potential of the river Dikrong (tributary of Brahmaputra) and provide cheap hydro electric power to the north-eastern states, thereby improving power availability in the region. 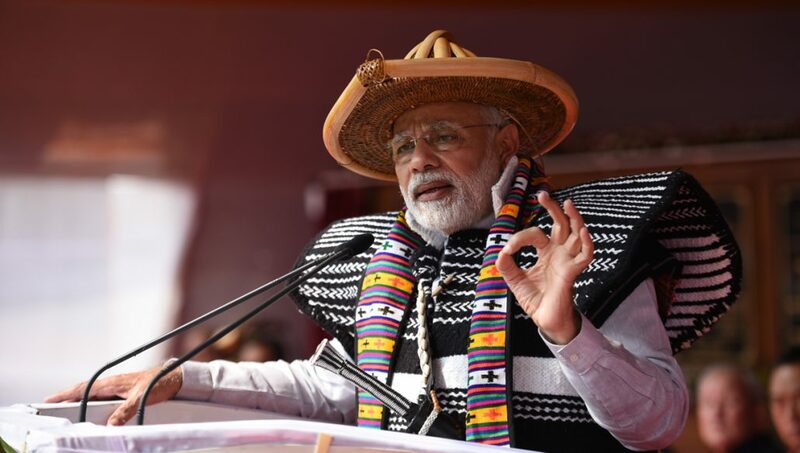 Foundation stone for a permanent campus of Film and Television Institute of India (FTII) at Jote, Arunachal Pradesh will be laid by the Prime Minister on this occasion. It will cater to film students especially those from the north-eastern states. The Prime Minister will also inaugurate the upgraded Tezu Airport in Arunachal Pradesh. The airport has been retrofitted and new terminal constructed for making it fit for commercial operations under UDAN scheme. 50 health and wellness centers in Arunachal Pradesh will also be inaugurated by Modi. Health and Wellness Centers is one of the vital components of Ayushman Bharat in ensuring Universal Health Coverage. The Prime Minister will also declare 100 per cent household electrification in Arunachal Pradesh under Saubhagya Scheme. From Itanagar, Modi will return to Guwahati. Here he will lay the foundation stone of North East Gas Grid which will ensure uninterrupted availability of natural gas across the region and boost industrial growth in the region. The grid is part of Government’s plan to provide cheap and quality gas to the entire North East Region. He will lay foundation stone of City Gas Distribution Networks in Kamrup, Cacher, Hailakandi & Karimganj districts. City Gas Distribution ensures the supply of cleaner fuel (PNG) to households, industrial & commercial units.